Fruits, berries, nuts, and mushrooms abound in Dane County parks. Fragrant apples flourish in public orchards, luscious blackberries grow alongside hiking trails, delectable morel mushrooms thrive at the base of tucked-away trees, and so much more. The best part is, these tasty treasures are free and available to the public. 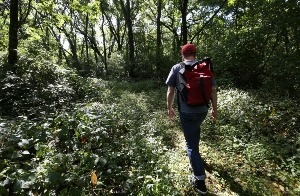 Foraging, the search for food in nature, is allowed on all of Dane County’s vast public lands. Plants must not be damaged or removed from the site to ensure there will be foraging opportunities for years to come. Participants have unrestricted access to all edibles, but are encouraged to only pick what they need. “We’re trying to get families to go out there and pick things they would use for their house”, stated Chris James, Senior Landscape Architect and long-time forager. Thanks to Topf Wells, a volunteer with the Dane County Parks, Simpson Street Free Press interns were able to experience foraging. Wells guided the interns on a tour of the Neperud property, officially called the Sugar River Wildlife Area (Basco unit). This park is known for its dozen or so apple trees, with different varieties of apples, from MacIntosh to Granny Smiths. Burdock, wild asparagus, sour cherries, and pears also thrive on the Neperud property. They also encountered wild parsnip, an invasive plant that can cause painful chemical burns when its juice—from broken leaves and stems—touches skin in sunlight. “Part of foraging is also knowing what you want to avoid”, cautioned Wells. Dangerous or undesirable plants are why Wells advises beginner foragers to go with an experienced forager if they are searching for edibles they aren’t familiar with. “You should go with someone who knows what they’re doing the first four or five times,” he recommends. There are many resources available for beginners or foragers who want to increase their knowledge about plants. James suggested participating in workshops hosted by Dane County Parks friends groups, such as the Friends of Festge. The workshops are led by expert foragers who will lead groups into Dane County parks and show them edible plants and plants to avoid. “These groups are important because they teach people how to properly forage,” stated James. Wells urges participants to not be discouraged after a fruitless attempt. “You may need to see the location, note the ripeness of the fruit, and come back later”, he said. One can also check which plants are in season by going on the foraging page on the Dane County Land and Water Resources Department website, which lists information about various edibles that can be found and the parks that contain them. It also contains basic guidelines, and even a link to a helpful interactive map. The foraging page is linked at the bottom of this article. Foraging is an engaging activity that is very accessible. It is year-round, with ice-fishing in the winter, mushrooms in the spring, berries in the summer, apples in the fall, and so much more. With so many options, there is something for everyone, and the possibilities are truly endless. James hopes the foraging will bring families together and connect people to their food. “I really think that it helps families to just go out there with their kids and pick food that they then bring home and eat. That’s giant. I mean, just that connection, which is being lost right now with large-scale agriculture”, stated James.